Constructed in the Early Sui and Five Dynasties, renovated in the Qing dynasty, this cave consits of the front chamber, corridor and main chamber. The main chamber is square in plan. It has a central pillar and a gabled ceiling in the front and a flat ceiling in the back which is connected with the central pillar in the shape of Mt. Sumeru. The east slope of the gabled ceiling shows the Chapter of the Universal Gate of Avalokitesvara in the Lotus sutra (scenes of salvations of Avalokitesvara) in two horizontal bands, one above the other, and the west slope is used to render Thirty-three Manifestastions of Avalokitesvara recorded in the same chapter of the Lotus sutra in the same compostion.The center of the flat ceiling features a square in which round draperies are painted around the top of the central pillar. The four corners each have a dhyana Buddha (the one in the northeast is lost), and the center motif is surrounded by the thousand Buddha motifs. The central pillar is shaped like Mt. Sumeru: it consists of the upper part of an inverted round seven-storeyed pagoda and a two stepped square throne on the ground. The upper six storeys are decorated with the small molded Buddhas and lowest storey contains a lotus with four dragons around the lotus stem. A niche is dug out in each of the four sides of the throne. The arch niche in the east side contains the statues of one Buddha and two disciples made in the Qing dynasty. On each side out of the niche is a bodhisattva statue renovated in the Qing dynasty. below the niche are images of bhiksus, bhiksunis, male and female donors. The arch niche in the south side contains a Buddha statue and a disciple, made in the Qing dynasty. On the wall inside the niche are two incarnated children, and on each side out of the niche is a statue of a bodhisattva, renovated in the Qing dynasty. Below the niche are male and female donor figure and yakshas, painted in the Sui dynasty. The arch niche in the north side contains statues of one Buddha and one disciple, and on each side out of the niche are a bodhisattva statue (only the one on the south side survived), all renovated in the Qing dynasty. The dragon heads on the niche beams in four side of the central pillar obviously follow the style of the Northern Dynasties, which exhibit the influence from the eaves and roof decoration in Han Chinese architecture. The west wall in the main chamber contains ten celestial musicans, railings and draperies in the upper level, and a walking Buddha surrounded by the thousand Buddha motifs in the middle level and male donor figures in the lower level above the landscape and figure paintings. The north wall contains ten celestial musicians, railings and draperies in the upper level, a preaching scene of Sakyamuni and Prabhutaratna surrounded by the thousand Buddha motifs, and attendants, bhiksus and male donors in the lower level. The space above the entrance in the east wall contains ten celestial musicians, railings, and draperies. The north and south sides of the entrance wall are covered with the thousand Buddha motifs, below which are donor figures, chariots, horses and grooms. At the junction of the lower parts of the four walls with the ground are all painted landscapes. On the ceiling of the corridor is a preaching scene painted in the Five Dynasties. The south wall of the corridor is covered with a Cintamani-cakra illustration together with six bhiksus and male donors in the lower section, while the north wall is covered with a Amogha-pasa illustration with images of bhiksus and donors in the lower part, all obscured. Thefour slopes of the ceiling in the front chamber contains seven Dhyana Buddhas painted in the Five Dynasties. The space above the entrance in the west wall contains an inscription flanked by a bodhisattva on either side. On the north side of the entrance is an attendant bodhisattva and a yaksha, on the north side, a preaching scene of the Maiatreya sutra and a row of donors in the lower part (alreadly obscured). On each of the south and north walls in the front chamber is an image of a heavenly king, and the one on the north wall was partly damaged in the Qing dynasty when a hole was cut through the wall. The upper part of the east wall depicts 10 celestial beings, railings, and draperies. Below them are thousand Buddha motifs. The middle part of the south side of the entrance contains images of twelve female donors, while the north side has images of twenty-six male donors, a horse, a chariot and a groom together with eight male and female attendants. The lowest part is decorated with landscapes. The west wall is divided into four parts: the upper border for 12 celestial musicans, railings and draperies, the second part for the thousand Buddha motifs surrounding a walking Buddha, the third part for one bhiksu and thirty-six male donors, and the lowerest one for landspaces and animals. The west wall is divided into four parts from top down: the upper borders for celestial musicians, railings and draperies, the second part for thousand Buddha motifs, the third part for twenty two male donors, and the bottom part for landscapes and figure paintings. On the border are fourteen celestial musicians, railings and draperies, in the middle are a preaching scene of Sakyamuni and Prabhutaratna, below the preaching scene are twenty-male donor figures, two attendants, two bhiksus. At the bottom are landscapes. On the north wall is an illustration of Amogha-pasa with six bhiksus and male donors in the lower part, all blurred. 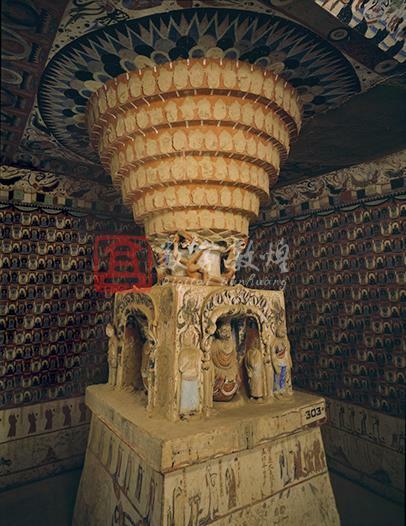 The top contains a preaching scene painted in the Five Dynasties. On the space above the entrance is an inscription with an attendant bodhisattva on either side. On the south side are images of a bodhisattva and a yaksha, and on the north is a Maitreya sutra illustration above a row of donor figures (obscured). On the north wall is an image of a heavenly king painted in the Five Dynasties, which was partly damaged due to the hole cut through the wall in the Qing dynasty. On the ceiling and four slopes are seven Dhyana Buddhas.